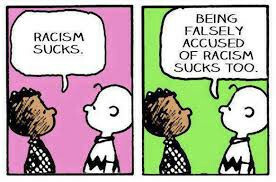 The media, the politicians, and yes even your coworkers are so quick to throw out the claim “you are a racist” these days. It is truly disturbing on so many levels. However, let’s look at the term and what it really means; but, before we do, one must understand a couple of things. 1. Words mean something, and it is so very important to understand that words translate ideas that once spoken, cannot be taken back. An idea that someone has, a seed planted in the mind WILL take root and grow and color your perspective on many things. It is so harmful to say a word falsely when we know that it could ruin someone’s perspective or their reputation forever. Labeling someone as a “Racist” slanders their reputation and causes people to doubt everything they say and puts them on the defensive. In the case of an innocent person, this makes someone guilty BEFORE proven guilty. Our system of laws and yes, even freedom, is built on the OPPOSITE idea that one is innocent until proven guilty. When you falsely use a word to label someone instead of factually refuting their point, YOU ARE GUILTY OF UNDERMINING FREEDOM ITSELF. 2. There are other words that explain someone’s thinking that may be more valid than the term racist. Let us look at number two first. Once words are truly understood, one can use them truthfully and have a better understanding of someone else’s argument or point of view. Remember, most people that you are going to argue with about a topic are from your country and thus a common ground of freedom of thought and expression is shared. Whether you like their opinion or not, they do have a right to that opinion and you have a right to dispute it respectfully. How can you dispute someone’s opinion and possibly change their mind to your way of thinking if you don’t even understand the words they are using or where they are coming from? As an intellectual adult, let’s look at two other words before we explain the word racism. Discrimination: the power of making fine distinctions; discriminating judgment, to note or observe a difference; to distinguish accurately. The next word is STEREOTYPE. A stereotype is based on data and observation of actual events and persons. For instance, I am from Indiana and I have lived in Georgia, Virginia, New Mexico, Missouri, and Arizona. Over the course of 20 some years of driving in these states, I have reached the limited data conclusion that Indiana drivers are the most polite drivers because they will let you switch lanes or get in front of them on the road, and they also typically wave a thank you when you let them in front of you. That is a stereotype that is based on things and people that I have actually seen. It doesn’t hold true 100% of the time, but it is GENERALLY true. My sister has worked in retail her whole life and while working in one particular city as a manager, she noticed that the majority of Hispanic people that entered her store usually ended up stealing things (not many Hispanics in her city). She formed a stereotype based on actual events that happened in her life, that Hispanics were thieves and that she shouldn’t trust them. Her belief is not racist. Her stereotype can be changed if she meets more Hispanics that DON’T steal because she does not hold a core belief that she is better than them. She is not racist, she has formed a factual stereotype because in her line of work, in that populace, it was GENERALLY TRUE. Remember that stereotypes are based on a group, population, class, gender, etc. An example of a good racial stereotype is that Asians are good at math. This comes about because IN GENERAL the Asian culture places more emphasis on schooling and knowledge. This means, that in general, if you meet an Asian they will probably be more scholarly (and thus better at math) than the average American. STEREOTYPE: a simplified and standardized conception or image invested with special meaning and held in common by members of a group. If I don’t date black people because I prefer white girls, that is discrimination (which is NOT wrong). If, instead I choose to only date white girls because I believe they are superior to other races, then that is racism and is wrong. Racism is an inherent dislike, hate, or discrimination based on skin color alone because you feel that skin color/race is inferior to yours. In other words, racism is the core belief that you are superior to another merely because of skin color. In fact, this was the belief of Hitler. The Holocaust was based on the idea that Jews, Blacks, etc were inferior to the “Master Race” and it would better suit the world and human kind to kill them all. His racism was grounded in the common belief of evolution. Evolution, the idea that the universe somehow defies the Laws of Thermodynamics and is constantly getting better naturally leads to the idea of racism and genocide. If human beings are evolving, then some groups of humans will naturally be superior to others. Following this train of thought, the superior and inferior races would naturally have noticeable differences and the most noticeable would be physical features such as skin color, bone structure, etc. For those who believe in Evolution, it is only natural to become racist, and who wants to believe that their race is inferior or less evolved? Racism is evil and leads to the genocidal Nazi system that Hitler used. That is why you will see people call you both racist and Hitler at the same time. To go back to point 1, let’s not be so quick to call people racist. Please look at facts and argue points of logical discussion instead of name calling. If you feel it necessary to name call, please be factual. Remember that everyone discriminates and that is a normal human thing to do. Most people have stereotypes and those are based on facts and actual experiences. Few people actually believe that they are superior simply because of their race, if they do, they are guilty of racism and deserving of that evil label. Be smart, don’t be ignorant, and be careful of throwing around labels merely because you disagree with someone.